As is usual, we have a brief round-up of books we have found interesting or noteworthy this year. While we mainly focus on new books, we include a couple of new editions of older books, and of course, our previous reviews might still be of some interest (2005, 2006, and 2007). The prize for the most optimistic title this year goes to Wally Broecker, for “Fixing Climate” (written mainly by Robert Kunzig). This is a book written in a particular style – a number of recent advances in relevant paleo-climate (abrupt changes, mega-droughts, etc.) are examined through the lens of a single scientist and their one key measurement or observation. This makes for a good narrative, but without wishing to take anything away from the great science discussed or the individual insights, it’s only a partial picture of how these interesting ideas actually took root and got validated by the wider community. The climate fix the book ends up backing is a scheme for the air capture of CO2 (discussed here, and more recently here). The technology is fascinating, but at over a couple of hundred $/per ton CO2, the economics are a long way from being viable. But read about it for yourselves. Finally, it is definitely worth paying attention to books that may have been out for a while, or in a new edition. 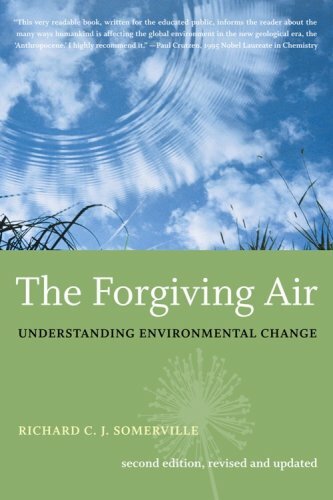 We were particularly impressed with Richard Somerville’s award-winning introduction to understanding environmental change “The Forgiving Air” which has just been re-issued. Another notable paperback this year was from Joe Romm (of Climateprogress.org). His “Hell and High Water” is mostly focused on policy solutions. As is a new book by Jay Inslee and Bracken Hendricks “Apollo’s Fire“. Congressman Inslee has been known to pass by RealClimate now and again. It does worry us a bit that the very first chapter refers to our friend and colleague Cecelia Bitz — a noted sea ice expert at the University of Washington — as ‘Carol’, and we hope that this is not indicative of the fact-checking care in the book. It looks to be an interesting contribution to the discussion of U.S. climate policy and it is especially timely to have a serious book on solutions to the problems in the Middle East, climate change, and the economy, all rolled into one. We look forward to reading this more closely. Feel free to suggest other interesting titles in the comments. Peridot is another name for olivine. Peridotite is an olivine-rich type of rock. Are all mechanisms on the lists above “geoengineering”? Semantics apart, are any of them likely to “screw things up”? Some of them are SACTCAR. Some are not. Caldeira and the BBC seem to be limiting their attention, and trying to limit yours, to the ones that are. I take it that the intent of this thread is to discuss credible climate change-related books and steer clear of wandering into the contrarian morass/apologetics/diatribes? Asking because I recently looked briefly at a new book by Roy somebody (Spence?) from Alabama Huntsville I think it was. It appeared to be a strange combination of contrarian “arguments” mixed with some reasonable stuff. But overall I was taken aback by some of the statements this guy made (and he is I think, a meteorologist) that indicated he didn’t understand basic ideas, like the reason why climate can be predictable over much larger time scales than weather. And some other strange statements, not even going into ideas about social considerations, economics etc that I think he wandered into. I’m not even a climatologist but it looked like he didn’t know what he was talking about. It was disheartening. Oops, I may have just violated the threads intent, sorry. Personally, yes, I’m pretty much ignoring ‘negative emissions’ because I don’t see any sign anyone is interested in paying for it to be done, and because biogeochemical cycling works now, it’s currently handling maybe half the fossil carbon we’re putting into the air, but the ocean pH change is happening much faster than climate change. I see no way ocean pH change can be controlled by continuing to burn fossil fuel at even current rates, let alone faster, and then adding some hypothetical carbon capture. — stop shoveling coal into the firebox? — blow the whistle continuously to let off steam, and keep shoveling? Seriously, there is a huge natural world full of processes that handle CO2 from atmosphere and water. We’ve increased the CO2 in the atmosphere very fast; CO2 in the water is now increasing rapidly. All those natural biological cyclers are already dealing with the increase, or rather half the increase. Rate of change is the concern. We have no clue what it would take to change the kinds of primary producers in the ocean. We’re harvesting krill now, as well as forcing changes by varying CO2. Sometimes the right answer is to back slowly away from the problem rather than keep frantically twisting levers and pounding on switches hoping to somehow make things better. Spencer, I really enjoy reading your internet version of the discovery of GW. I have learned more from that work about the history of the science than from any other work. It is very well written and explained, at least for lame brains like me who formerly knew nothing about it. Do you continue to revise that version, and will it be published in toto in book form? Also, what journals are strongest in climate change science history type articles? Thanks again, terrific contribution. How’s the new edition of Ruddiman’s textbook (Earth’s Climate)? Geoff Beacon (42) — Dolorite is a volcanic rock, so surely olivine rich. Do you have a link to weathering such rock? Ray Ladbury (54) — Thanks but your link won’t work for me. With just the authors and title I can find the paper. That would be Roy Spencer. Thanks. The negative scale was assumed to be the approximate inverse of the positive one, in terms of expertise needed to find errors. I.e., -5 probably has a lot of equations or statistics in it, -1 is detectable with minimal math, etc. That’s the complete Y scale, but the first cut was to try to get the positive scale right. One can put *avowed* beliefs on the X scale, i.e., from 0 to 1.0, giving a person’s avowed estimate of the probability that some idea is true. For some, the only possible values would be 0.0 or 1.0, [all-or-none from psychology]. For many people, there would be a distribution, which presumably would be ~normal [say mean=.5, std deviation=.2 for someone who really has no strong opinion], although more like lognormal near 0.0 and a reversed lognormal near 1.0. I wouldn’t get carried away with that,and for simplicity would just assume a normal and give “most likely” estimate. I’m not sure how many people routinely think about distributions – I know I’ve had to wage a long fight in computer performance measurement to get more people to think that way. An open-minded person with no particular knowledge might be at (.5,0), with an implicit large range. This gives something like political elections: there is relatively little chance of swaying people at (0, ?) or (1, ? ), but one can perhaps help people at (.5,0) sort out the science from the non-science and anti-science. I.e., educate the independent/moderates. I’ve talked to people at (0, -2:0), and they are *sure*, and in some cases, won’t even read a single (good) book. While one cannot definitively determine the difference between real belief and avowed belief, one would expect that anyone at (0, 6) who writes (0, -3:0) material may well be doing so for reasons other than science. It is hard to tell sometimes. I’ve talked to people at (.3:.9, 1:2), who may get confused by material at (0, -3:-4), and they are the ones asking for good introductory texts and help in sorting things out. They certainly need the negative scale also, to give a complete landscape of the information floating around. Jim B: does any of that fit your question? “Now the danger that we face is the Venus syndrome. There is no escape from the Venus Syndrome. Venus will never have oceans again. Given the solar constant that we have today, how large a forcing must be maintained to cause runaway global warming? Our model blows up before the oceans boil, but it suggests that perhaps runaway conditions could occur with added forcing as small as 10-20 W/m2. There may have been times in the Earth’s history when CO2 was as high as 4000 ppm without causing a runaway greenhouse effect. But the solar irradiance was less at that time. What is different about the human-made forcing is the rapidity at which we are increasing it, on the time scale of a century or a few centuries. It does not provide enough time for negative feedbacks, such as changes in the weathering rate, to be a major factor. There is also a danger that humans could cause the release of methane hydrates, perhaps more rapidly than in some of the cases in the geologic record. Could one of the RC climatologists comment on his statements? I’d like to see the model myself, but he does say that the model he was using broke down before reaching that point. I recall some years ago — before RC started up, I think — I came across a mention of one paper in some respectable refereed journal that also had calculated a slight possibility of a runaway to the point of boiling water off. I recall, I think, that part of the sequence was a lot of hydrogen lost from the top of the atmosphere, and the deficit would become a feedback (lose the hydrogen and you lose the option of recombining that to make H20. There was some mention of heating around the equator, I think, and lots of moisture being carried up to the stratosphere and disassociated as part of the hypothetical series of events considered. Or I may be misremembering it. Sorry to be so vague. This was a long time ago. I’ll poke around and see if I saved a reference somewhere. Since that time I’ve seen only papers saying it wasn’t in the range of possibilities — but it stuck in my mind because it was a sobersided mention in a paper, not the main focus, just a paragraph or two saying they had not been able to rule this scenario out completely. from very abundant rocks such as peridotite or dunite. and the http://www.nomileshighclub.org.uk (2007). Although we have hardly any members, these demonstrate some non-skeptic commitment. to limit yours, to the ones that are. has some relevant discussions, that I missed. – stop shoveling coal into the firebox? – blow the whistle continuously to let off steam, and keep shoveling? – stop shoveling coal into the firebox and blow the whistle continuously. We may be rolling downhill. Environment and Sustainability at Newcastle University. seem spectacular. Perhaps the paper Ray Ladbury suggested is better. Can we have a working link? What’s this to do with “Books ’08”? it’s community, make some more wikis on topics like geo-engineering? Or even put articles on Wikipedia. Re #60, on reading the article about 1 watt or 2 watt of global dimming as we shall call it then it it is 1 watt than that is good as climate sensitivity has not caused not much warming (the difference between GHG and dimming factors) but if it is 2w then climate sensitivity is more powerful as 3-2 is 1 and that has caused more warming really then. For some reason the dimming power of aerosoles is said in the presentation/paper to be around 1.3 W but if it was 1.7W then that would push up sensitivity as the aerosoles are reduced. The Venus Symdrome then should surely depend on finding out the nature of this aerosol cooling. The warming factors have been nailed (as James Hansen puts it) but not the cooling factors which have to be in order to measure humankinds response to warming. This sort of article would delight the environmentalists in many ways who enjoy the articles in the media that propose some kind of far away doom for your grandchildren. It probably will also annoy the skeptics or would find Venus Symdrome hard to swallow if the cooling repsonse has been closer to 2W than 1W. In addition to The Forgiving Air and The Discovery of Global Warming, Mark Maslin’s Global Warming — A Very Short Introduction (Oxford University Press) has also arrived in the second edition this year. In my opinion, the first edition (2004) was somewhat unfinished, but the second edition is much better completed. This book first discusses climate projections in the mainstream of IPCC AR4 and says that they are alarming enough, and then goes on to discussions of various “climate surprises” (fast breaking down of ice sheets; complete regime change of deep ocean circulation; huge loss of methane hydrates; die-back of tropical rainforests). I think that this formulation of points of discussions is very good. The Rough Guide to Climate Change by Robert Hanson,2007. 11 UKP ,$17. As you can see the price is fairly low. I have not read it completely but every time I dip into it I get the impression that it is very well written and reliable. It has quite a wide coverage, is fairly (but not completely) non-technical and would be an excellent introduction. It is also almost up to date (post AR4). I have few criticisms so far. It is sometimes hard to find a topic. If you want to read about the cooling of the stratosphere you have to look up ozone in the index which will inform you about the cooling produced by its depletion and direct you to another part of the book where you can read about the second cooling mechanism (greenhouse cooling). Finding the section on climate sensitivity is even harder if you start from the entry in the index, but is quite good once you get there. Of course since the book appears to ban all maths, it can’t tell you about logarithmic relationships so it insists that the doubling of CO2 must start from its pre-industrial level. The contrarian campaign is covered but rather gently. I would not go here for an up to date discussion of biofuels especially as it has been put into a section called “Making Transport Greener”. It emphasizes paleoclimatology, and has many nice colorful graphs, a big plus for any science book. Just wanted to say you are one of my heroes. I link to and quote from your site all the time. IMHO, you can’t ask for a better introduction to the issue. Gwynne Dyer’s “Climate Wars” was my favorite CC book of the year. I would like to construct a reasonable correct climate model in Excel. Does anybody know of a good book on the subject. That is a book that gets fairly deep into the technical/computational aspects of climate models. Alternatively, does anybody know of a good spreadsheet model that is already in existance? I think Climate Wars is a significant contibution as well. Gwynne Dyer is a military man, a former instructor at Sandhurst (a a British institution similar to West Point), who is interested in and usually writes about war, including what leads to it. He seems to have taken a year or so to get up to speed on climate, in part by meeting and interviewing some of the top flight scientists. He writes as if climate is changing, and discusses how the regional changes he believes are likely will change international relationships by increasing tension. Dyer is spelling out scenarios most people don’t want to think about. He says he contacted some in the Pentagon who are waking up to the issue. Re: Hansen’s Venus Syndrome. They said the Titanic could not sink as well. I never checked out his math, but Bill Rees at UBC, the first person to publish a discussion of the concept of an “ecological footprint”, used to claim that if all the carbon in the planetary system somehow ended up in the atmosphere the planetary temperature would be higher than the boiling point of water. Where do people get the idea that just because what they think they know today tends to make this idea sound incredible it is impossible? It would indeed. And how do you suggest that all the carbon in the planetary system will wind up in the atmosphere? Most of it is in the form of carbonate rocks on the sea bed. 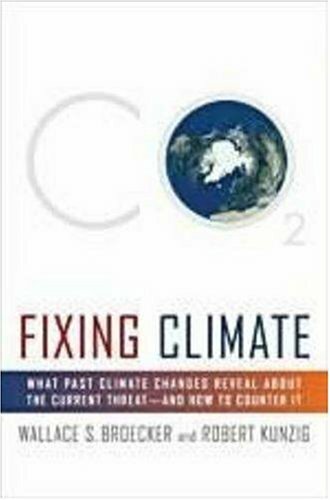 I write as the UK publisher of Fixing Climate (Profile Books). We hosted a number of events with Wally Broecker in the summer and the question of the economics of carbon scrubbing was high on the agenda. Wally, understandably, was reluctant to commit himself to a figure for a technology in pre-prototype stage, but he offered around $25-40 a ton as a best guess for actual CO2 removal. This is somewhat less gloomy than the review above suggests. Indeed, if a tax price is put on CO2, as it is in Norway’s oil industry, then the removal costs seem attractive. They certainly make sense in the context of a tax on CO2 generation in the aviation industry and would add relatively modest amounts to the cost of a flight – perhaps $40-60 on a return from London to New York. Here is a direct link to a spreadsheet. Now I get to study it some. He also discusses some of the alternative technologies widely bantered about. Just a reminder that James Hansen is quite knowledgeable on the Venus atmosphere: “For his dissertation, Hansen investigated the effect of atmospheric dust on the temperature of Venus”. Which of course doesn’t tell us whether he’s right in saying that burning all available fossil fuels would lead to a “Venus syndrome” on earth, to be sure. “Chikyu ondanka no yosoku wa ‘tadashii’ ka?“ (Kyoto: Kagaku Dojin, 238 pp.) whose title can be translated as “Is the prediction of global warming ‘correct’?” was published in November 2008. This is an introduction to climate change projection written by one of its active key persons (with the MIROC model). It explains the particular issue, rather than the whole issue of climate change, to a lay person. It starts with the remark that things are not always black or white, right or wrong. It tells how a climate model is constructed, what kind of assumptions are used in the climate projections discussed in IPCC AR4, and what kind of uncertainties remain despite of the modellers’ efforts to reduce them. Are there a similar book in English? Re responses to my post in 77 … I’m a bit surprised. I didn’t think he was all THAT bad. He says the risk is real and the underlying physics support it and it is to be dealt with aggressively. Critiquing the movie is hardly a cause for wholesale dismissal as per Mr. Romm. I note that of the three opinions presented, the non-scientists provided the harshest criticism, especially upset about the film critique and the fact that impacts were given less serious consideration — however, from conversations I’ve had with scientists involved in the IPCC process, the level of real understanding of impacts is much less solid than that behind the science of GHG impact on temperatures. The further out in time you get and the smaller the geographic scale, the less solid/more speculative impact claims, no? Again, this isn’t to say that urgent action isn’t needed, it is. However, the book hardly puts the man in the same camp as Fred Singer. I just wanted to mention a book i have written on Global Warming, titled The A-Z of Global Warming. The book provides a guide set out in unique A-Z format of all issues relating to global warming and climate change with all material sourced from the latest scientific materials. Ideal for anyone wanting to know more and get to the bottom of the facts on global warming. Published by Schmall World Publishing in Sept 2008.Please visit my website or Amazon for more information. S.Rosser.